I was at the Handbuilt show earlier this year, and remembered how bad I had to pee... I got the bike all loaded up in the truck and ran to the ladies room! During that split second of running into one of the stalls, I swore I saw Jessi Combs out of the corner of my eye, but like I said... when a girls gotta go!!! I came out to wash my hands and sure enough, my role model, the ONE I have always looked up to, MY ONE CHANCE TO MEET HER!... and she was gone. I turned the corner outside of the rest room... AND THERE SHE WAS! I Immediately went up to her, shook her hand, and thanked her for making welding gloves that actually fit my hands. Next to her was the most adorable woman I've ever met. Theresa Contreras, is one of the best painters in the industry and she does pin striping! So much talent in such a little 5 foot nothing body! I thought for sure that this would be the only time I would ever get to talk to these two ladies. They were so nice and so humble. 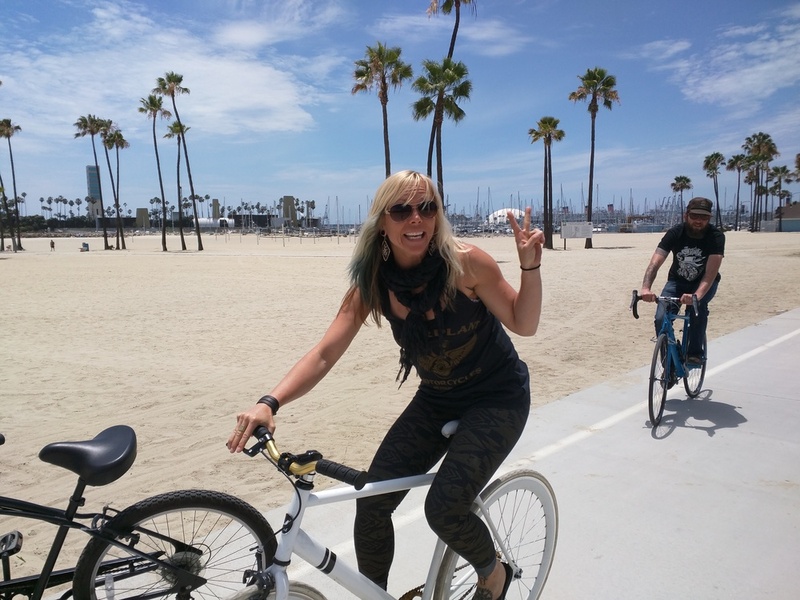 Shortly after, I got an email from Jessi asking if I would like to come hang out with them at the Born Free Motorcycle Show outside of LA and help them with their booth called "The Real Deal". I am pretty sure I died and went to heaven. Anyone would be stupid NOT to drop everything and go out there. 'The Real Deal' is a company these two ladies started and it was debuted this past weekend. We had different seminars, like pin striping, welding (we were not allowed to do this one), and metal shaping to show what real women can achieve. Their goal is to put tools in women's hands without the intimidation factor. So many people came to the hand crafted booth that they designed. Everything they do is really impressive. Make sure you keep up with these women because they will be changing the face of this industry in such a positive way. They want to inspire, build, and create this community where everyone helps out anyone who is interested in learning how to use their hands. Basically... they are freaking awesome. All in all, this trip was magical, the people at the show were all very rad, and the bikes there were all awesome. There was some real talent here this year.